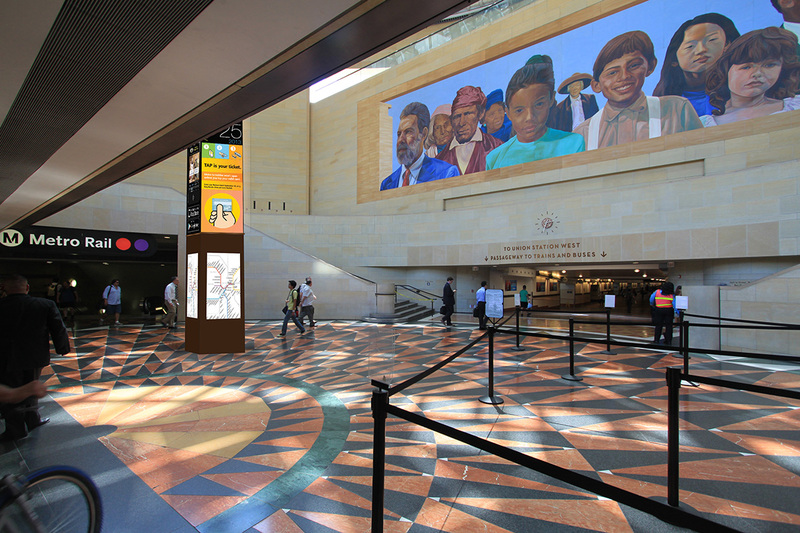 When Metro started the Union Station Master Planning process, the agency kicked off with a series of focus groups including many kinds of stakeholders – transit users, transit operators, neighbors and business improvement groups. One of the themes heard overwhelmingly is that while our stakeholders were excited about the master plan and a future vision for the station, they wanted Metro to make immediate improvements. Which, in fact, Metro plans to do with a signage improvement program as detailed in the document posted above. Among our stakeholders, it was noted that many people get lost in Union Station. 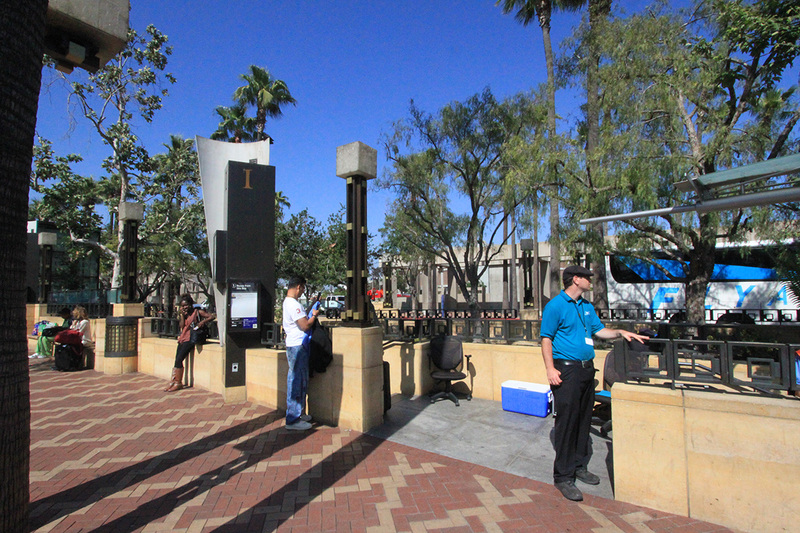 Some of the common complaints: it’s a big place and it’s often hard to know where you are — and where you’re supposed to go to reach buses and trains and places such as Olvera Street, which is only a block away from Union Station’s frontage on Alameda Street. It’s not surprising that visitors often cannot find their way around. When the station opened in 1939, clarity of circulation was inherent in the design. Street cars, taxis and private cars were funneled to the front side of the station. Once inside, passengers went from the ticket hall in front to the waiting room to the gates that led to platforms. Carefully laid tile in the floors guided arriving and departing passengers to the appropriate locations and it was easy to get around without much thought and without much signage. After a major decline in rail service that lasted through the 1980s, Union Station is a far different place today. 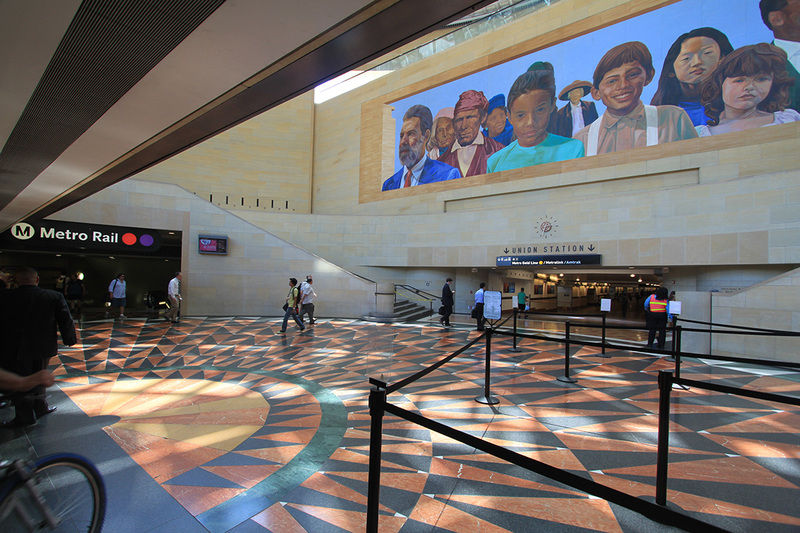 The station is now served by the Red/Purple Line subway and the two segments of the Gold Line — which will one day be linked to the Blue and Expo Lines via the Regional Connector project. There are more than a dozen Metro Bus routes that stop near the station, not to mention stops for other muni buses. 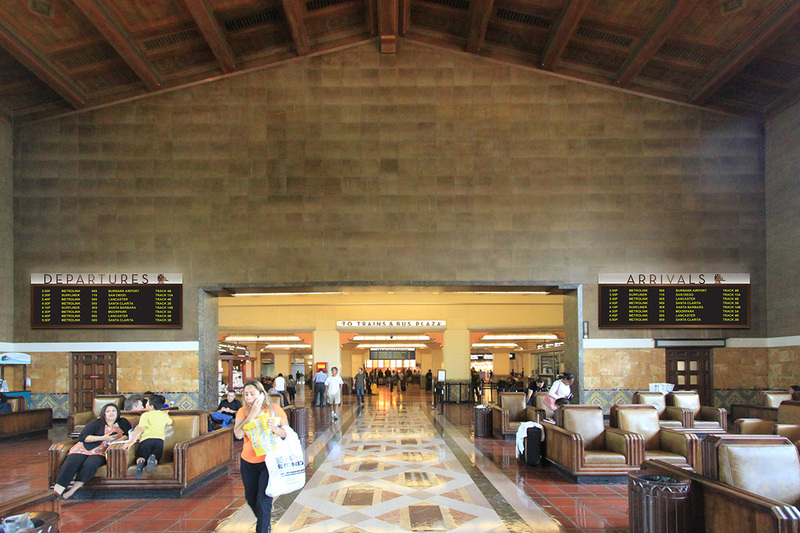 Union Station also serves inter-city rail (Amtrak) and commuter rail (Metrolink), the FlyAway bus to Los Angeles International Airport , inter-city buses and various shuttles. In 1995 Metro opened its headquarters building in the “Gateway Center” area of the station, followed by the opening of Patsaouras Bus Plaza and the East Portal. This represented a fundamental change in the design of the station – we now had an east entrance to the station and the passageway (aka the tunnel) now had two sides to it. Efforts were made to direct transit users and visitors across the station as it grew and changed, but signs were added on a piecemeal basis and there was never a consistent design. For example, in our study of the existing signage conditions, we identified signs directing customers to “Metro Headquarters,” “Gateway Center,” “MTA Headquarters,” or “Gateway Plaza.” Four different names for the same building! With Metro’s purchase of the station in April 2011 and commitment to planning for the long term, the new Environmental Graphics and Signage plan (the “Plan”) is a first step in that direction. The Plan brings a deep knowledge of the movement of passengers across the station and provides a plan and design that offers both beauty and consistency. The plan also takes advantage of new technology Metro is testing to make Union Station a pilot site for better incorporating technology into our transit system. •Preservation of the four existing historic mounted signs. With close supervision of our consulting historic architect, ARG, Metro is removing, documenting and storing the last of the concourse gates and the Information cabinet. Other historic signage will remain, as shown in the above slide. •Opening up the concourse. The Plan aims to create clear sightlines from the passageway to the western (Alameda) entrance to the station and to the South Patio, key travel paths for transit users and visitors. This will be achieved by the removal and storage of the historic signs, coupled with the recent removal of the seating from the concourse area. •Moving the “queuing” of Amtrak passengers waiting for seat assignments and boarding in the concourse. Many users had their travel path blocked by stanchions and rows of baggage-carrying passengers lined up from the concourse down into the waiting room. These passengers now get their information at the Amtrak service desk and wait in the historic seating in the beautiful waiting room. •Standard nomenclature. The Plan offers both a new naming convention for general orientation around the station as well as a standardization across the names of various “places” on the station property. The overall site remains Union Station, but we have designated “Union Station East” and “Union Station West” to help general orientation for first time visitors, and we continue this convention on maps and directional signage. •Perimeter improvements. The Plan includes a series of perimeter wayfinding signs at scales appropriate for pedestrians, bicyclists and drivers. We are also introducing identity pylons at 3 main corners: Alameda/El Monte Busway, Cesar Chavez/Vignes and the entrance to the Patsaouras Bus Plaza. •East Portal Pylon and Interactive Help Desk. We will place a new pylon in the East Portal, carefully located outside the path of travel for transit connections, to provide a clear marking point as well as pilot a new interactive “help desk” function. The pylon will include four, 55-inch interactive touch-screens that provide Metro’s trip planner system, web page as well as internet access focused on tourist and destination information. 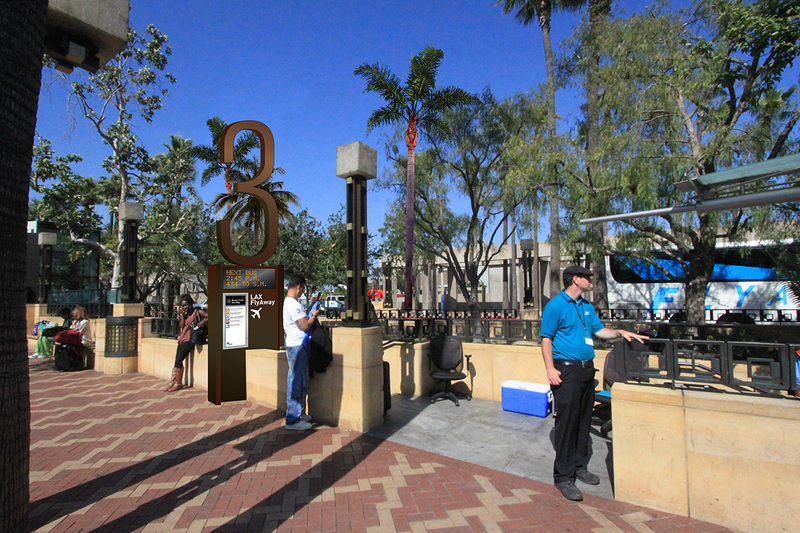 •New bus bay markers at Patsaouras Bus Plaza. We will replace the bus bay markers with new markers, equipped with Metro’s real time NextBus system at every marker. 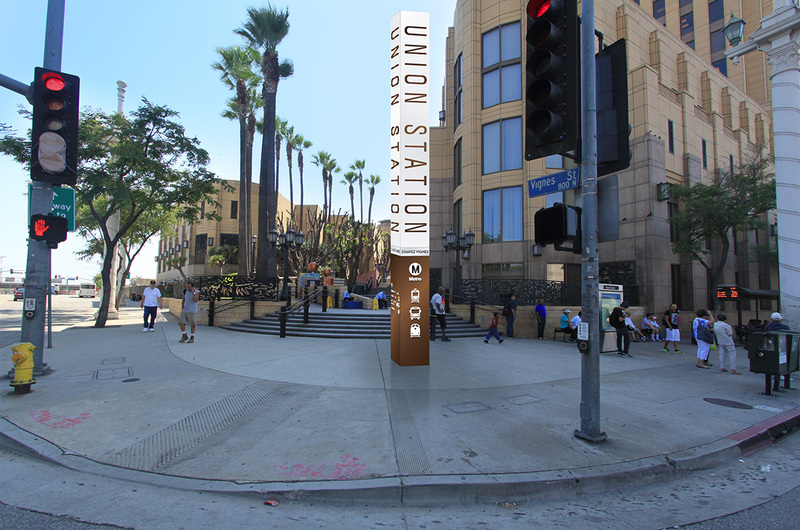 The removal of some existing signs is set to begin March 11, with the with the complete signage package in place by May 3, when Metro will host a slate of activities honoring the 75th anniversary of Union Station. The first stage of this Plan does not include the Gateway Parking Garage, but this will be re-signed in a subsequent phase and is scheduled to be completed by fall 2014. I don’t know if the following improvement will be made: When exiting from the Gold Line, I had to walk to the main concourse to both buy a Metrolink ticket and to find out what track my train would leave on. Will you be able to buy a Metrolink ticket at the Gold Line exit and also to view a board indicating what platform you will be leaving on? Also, is it at all possible to clean the windows of the elevator going up to and down from the Gold Line? Everytime I have been on the elevator its windows have been filthy. Overall, I think this looks pretty good. I don’t think you chose the best parts to show on this post, but looking through the document there are some definite improvements. I would say I don’t think it’s a good Idea to say “Metro Subway” with red and purple circles and then “Metro Rail” with a gold circle. As we all know, the Gold Line is a subway at some points too… and all of the rail lines (whether heavy rail or light rail) are branded simply “Metro Rail.” There’s no need to change that here, and we should stay consistent with using “Metro Rail” to reference any of the colored rail lines. I think it is great and it is long over due. I can not wait to see the changes, it looks great. 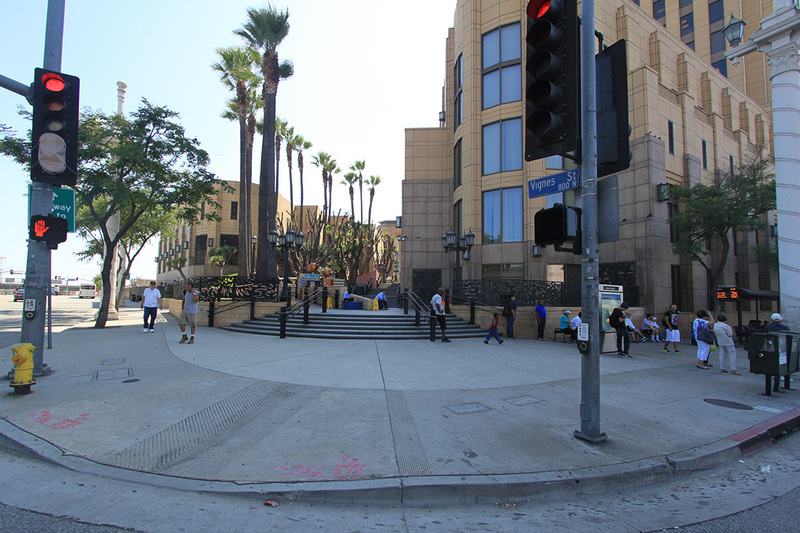 It would also help to improve the walking ramps and stairs to Metrolink and Amtrak. It is hard to find which ramp or stairs to take for the train that you need to board. It is so outdated looking and I am sure they can be improved as well. Also, have you noticed that many of the weather shelters over the the boarding areas for the trains; many of the shelters of the boarding areas are rusting pretty good. +1 for Steven White’s comment. The term “Metro Subway” is one even Metro doesn’t use as “Metro Rail” is the existing nomenclature. Just keep it simple and differentiate the lines by their colored circle as is the current practice. As for the Silver Line, I can see the reasoning for only signing that as “Metro” since Metro has yet to develop consistent terminology for its BRT operations. Using “Metro Silver Line” might cause others to look for the corresponding names for the rail lines. Perhaps “Metro Silver Line busway” or “Metro Silver Line bus” could work. Too bad the MTA is not as focused on IMPROVING AND EXPANDING BUS SERVICE, as they are about putting “signage” at a transit station that DOES NOT MOVE (in comparison to buses, which DO MOVE!). And to think the MTA has the AUDACITY to “propose” fare increases? 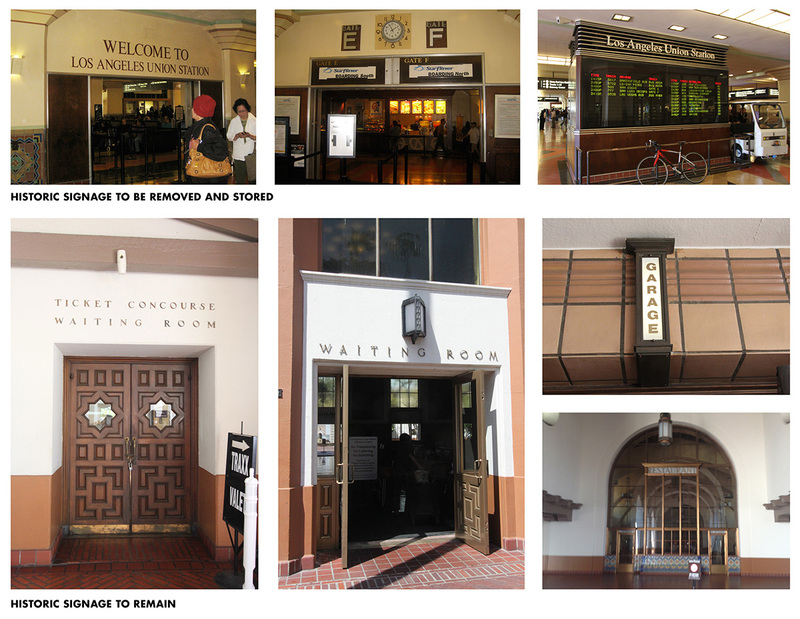 STOP SPENDING MONEY ON NONSENSE LIKE UNION STATION “IMPROVEMENTS” (signage or otherwise! ), and its “Master Plan”, and there WILL BE MONEY for bus line improvements! one thing that REALY needs fixing. when u are leaving the red/purple lines, the TV screens show times for red/purple lines. instead show something useful such as gold line and bus times. I think Wilshire/Vermont has this. it would be a good improvement . and an easy fix. The issue of figuring out which platform your Metrolink train departs from won’t be an issue if they kept it static instead of changing it all the time. Everybody in the world can do this except us. In addition to the wayfinding improvements I hope something is planned for the disgusting restrooms. Those no loitering and smoking signs are always placed right in the middle of the pathways throughout the station and beautiful patios, destroying the sense of symmetry and design of the station. Can’t they at least be placed off to the side of the doorways rather than blocking the walkways? Great, just what we need, more waste of tax dollars which bring zero revenue to Union Station and Metro operations. You know what most people and corporations and other transit oriented cities around the world do when they buy expensive real estate? THEY FIND WAYS TO MAKE MONEY OFF OF IT! They add shops and restaurants first, things that bring additional money into the system and then with the revenues earns, they go onto do station improvements. What you guys are doing is spending money that you don’t have and you guys are addicted to debt spending! Can’t Metro stop being this tax-sucking bureaucracy and start acting like a real business? Please, we’re drowning in taxes and all you guys do is spend, spend, spend. Must be nice to work for government – spend, spend, spend, and when money runs dry, you ask for more fare hikes, cuts to service, and raise taxes. A perfect, on-target analysis! It needs to be SHOUTED at the public hearing for fare increases on March 29! The new signage and other changes look great. But the train shed — the canopies over the platforms — are rusting away and badly in need of restoration and a couple of coats of paint. Are there any plans to undertake this work??? The arrivals/departure board is a historic part of the station and should be kept in place. It has lasted 75 years, why should Metro remove it now? Well, look at the master plan and you can see everything else Metro wants to obliterate. Station? It is the Los Angeles Union Passenger Terminal! Why is this fact being ignored? One suggestion to improve would be to make it clearer once you get off a train and find yourself in the tunnel, it seems you’ll be presented with two signs, one for US East and one US West, with train platform message boards. But if you’re arriving by train (and not transferring to another) and need to find which way to turn it’s not clear, there is only a small sign on the wall showing bus, rail, taxi and other information. The symbols & text should be added to the large overhead signs so that you know to go to US East for bus connections, US West for ticketing, taxi, etc. * Real Time arrival times at the bus loop on the East End of the Station. That is if they really are Real. I’ve had problems with it in the past. The system just gives you the scheduled time and if a bus conks out it wouldn’t convey that information. 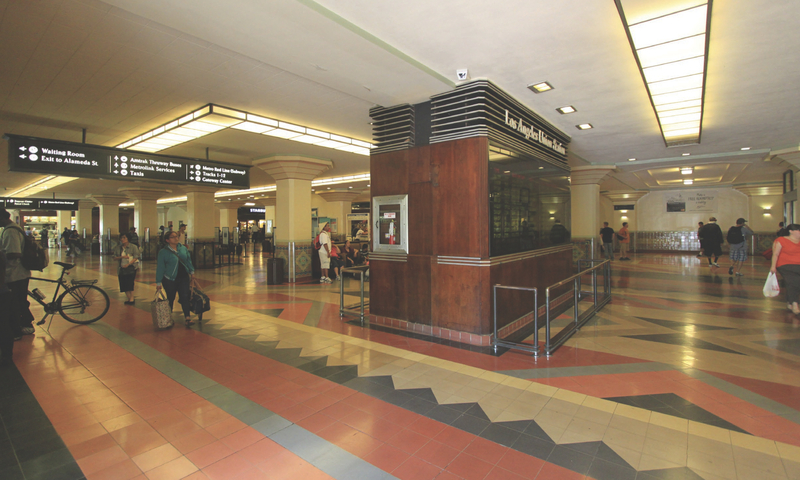 * Amtrak & MetroLink arrival and departure time screens in the Waiting Room. * Special Note: Keep the old one in place. I know it has problems when it rains but I like it and maybe the new ones could have a wood case to match. * The Gold Line entrance/exit needs some serious rework. Start with a couple of good, old-fashion ramps and stairs on both sides of the tunnel and extend the platform where the trains stop. Right now it’s just too crowded during the rush hours and to compound the crowding the location of the TAP machines and the elevator make matters worse. Someone who really needs to use the elevator has to tap the TAP card and then reverse course to get to the elevator door. Not so easily done in a wheelchair. Maybe a TAP machine could be installed on the platform. * There needs to be seating in the Waiting Room for people who use public transit. Also for people who buy something to eat. The way it is now if you get something at Subway Sandwiches or Famina and eat it on any Metro conveyance you’re subject to a ticket. Overall these look strong, but at least from the pictures I feel like the gold line is still poorly marked. I feel like every time I use Union Station, at least one person asks me how to get to the Gold Line. (I don’t think I look like I work there; I must just look like I know what I’m doing). I think part of the problem people have is even if they are going the right way, they feel like they’re headed up to another train platform. I feel like some extra signage saying “Metro Gold Line” – not just “Metro Rail” and a gold dot – would help them feel more confident. Now, the “metro rail”/”metro subway” distinction doesn’t help much either – I’m pretty sure the average user thinks of the red/purple/green/blue/gold lines as all one system, and Metro Rail is easy to confuse with Metrolink. That’s probably a bigger issue than can be tackled with this project. But really it should all have the same branding. Most world cities that have extensive “subway” or “underground” systems have lines that in reality run almost entirely aboveground – this doesn’t seem to cause much confusion. I just hope there are more opportunities to post advertising. Crass commercialism is the greatest thing Los Angeles has given the world! 1) As others have noted, Metro Subway/Metro Rail needs to have one consistent branding. I’ve never heard or seen “Metro Subway” anywhere else in the system. 2) Currently there is some confusion on the platforms. From the passageway you see track xA or xB while on the platform itself you see the display reading “Welcome to LAUS…platform y.” Is it platform or track? 3) I shouldn’t have to speedwalk to the subway entrances to see departure times for the red and purple lines. And there are no departure times for the Gold Line at all from the passageway. Are there plans to incorporate those schedules into the main departure screens as well? Or at least a separate screen along the way? 4) Speaking of the red and purple lines, if I had a dime for every rider who was confused as to which train they were on, I would have quit my day job a long time ago. This needs to be addressed down on the platforms and on the trains themselves. It’s also not clear (for some reason) that both the red and purple trains share the same stations from LAUS to Wilshire/Vermont. 5) Upon arriving into Union Station, the voiceovers in the subway should just say “all buses” instead of rattling off every single bus service. Then use “All buses” as you’re coming up from the platform. Perhaps then you could have some kind of signage for the specific bus services as you’re going up the escalators and onto the main level.